Modular burner management system designed to provide automatic ignition and continuous flame monitoring for commercial sizes of heating and process equipment firing any type of fuel. The Fireye MicroM Series Flame Safeguard Control is a compact, microprocessor based, modular burner management system designed to provide automatic ignition and continuous flame monitoring for commercial sizes of heating and process equipment firing any type of fuel. The MicroM is designed to be backward compatible with existing TFM, UVM and M-Series II controls. The MicroM MEC120 and MEC230 chassis with the appropriate MEP100, MEP200 and MEP500 series programmers provide operation similar to its predecessors and is usually directly interchangeable. The MEC320 and MEC480 chassis with the appropriate MEP300, MEP400 and MEP600 series programmers provide additional enhancements such as early spark termination, pilot proving, and interrupted pilot. The advantages of the MicroM are zero dependence on discrete components previously used for timing functions. The MicroM, through the use of micro-controller technology, incorporates smart diagnostic LED's, smart reset function for multi-burner applications, optional alpha-numeric display output (ED510), and serial communications via a Modbus or E500 Communication Interface. The MicroM system also provides additional amplifier selections. Along with the standard UV and Flame Rod amplifiers are UV self-check, Infrared, Cadmium Sulfide and a dry contact amplifier for use with the Fireye Phoenix scanner. All amplifiers are available with flame failure response times of 0.8 seconds or 3 seconds nominal (4 second maximum) and each provide a set of test jacks with a uniform range of 0-10 VDC for the measurement of flame signal intensity. 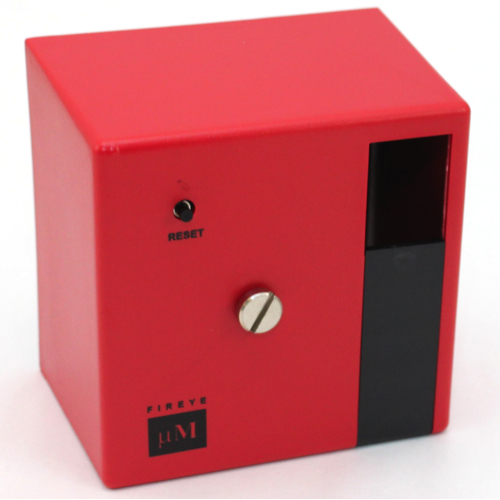 A complete MicroM system includes the appropriate flame detector, plug-in amplifier and programmer modules which connect into a standard chassis and wiring base. Interchangeable programmer and amplifier modules allow for complete versatility in selection of control function, timing and flame scanning means. Functions such as relight, recycle, non-recycle, two stage capability, non-recycle air flow, proof of air flow open at start, purge timing, early spark termination, pilot proving and pilot cutoff are determined by the appropriate programmer module. Type of flame scanner (UV, Repetitive UV Self-Check, Flame Rod, IR or Cadmium Sulfide or dry contact) and the flame failure response time (FFRT) are determined by the amplifier module. Optional plug-in daughter boards provide additional features such as remote reset, alpha-numeric display and serial communications. The MicroM programmers are micro-controller based modules that control the sequence of opera- tion and also interface with plug-in amplifiers, meter boards, display drivers and external communication devices. The programmers are available in an assortment of configurations necessary to resolve the application requirement. Current families of programmers for use with the MEC120 and MEC230 type chassis include the MEP100, MEP 200 and MEP500 series. Programmers for use with the MEC320 and MEC480 type chassis include the MEP300, MEP400 and MEP600 series. 120 VAC, 50/60 Hz Chassis with remote reset. 120 VAC, 50/60 Hz Chassis with interface to ED510, interface to E500 Communication Interface and Modbus capability. 120 VAC, 50/60 Hz Chassis with remote reset capability, interface to ED510, interface to E500 Comm. Interface, and Modbus capability. 120 VAC, 50/60 Hz Chassis with remote reset capability and interface to ED510. 230 VAC, 50/60 Hz Chassis with standard plug-in board. 230 VAC, 50/60 Hz Chassis with alpha-numeric display interface to ED510. 230 VAC, 50/60 Hz Chassis with remote reset capability, interface to ED510, interface to E500 Comm. Interface, and Modbus capability. MICRO M SERIES MEC320 CHASSIS FOR USE WITH MEP300 and MEP600 SERIES PROGRAMMERS. MicroM chassis with local reset; 120 VAC, 50/60 Hz, provides independent relay outputs on terminals 3 and 4. For use with MEP300 and MEP600 series programmers. MicroM MEC320 chassis with remote reset. For use with MEP300 and 600 series programmers. MicroM MEC320 chassis with alpha-numeric display interface to ED510. For use with MEP300 and 600 series programmers. MicroM MEC320 chassis with interface to E500 Communication Interface and Modbus capability. For use with MEP300 and 600 series programmers. MicroM MEC320 chassis with remote reset capability, interface to ED510, interface to E500 Comm. Interface, and Modbus capability. For use with MEP300 and 600 series programmers. MicroM MEC320 chassis with remote reset capability and interface to ED510. For use with MEP300 and 600 series programmers. MicroM MEC320 chassis with remote communications and independent relay output. For use with MEP300 and 600 series programmers. Use with MEP696 programmer only. MicroM chassis with local reset; 230 VAC, 50/60 Hz, provides independent relay outputs on terminals 3 and 4. For use with MEP300 and 600 series programmers. Programmer, Relight function, 10 sec PTFI. Programmer, Relight function, allow flame signal until 60 seconds after interlock circuit closes. Programmer, Non-recycle on flame fail, 5 second PTFI. Programmer, Non-recycle on flame fail, 10 second PTFI. Programmer, Non-recycle on flame fail, lockout on air-flow open with flame present, 10 second PTFI. Relight operation, 12 sec purge, 10 sec PTFI, reset lockout on line power interruption. Non-recycle operation, 0 sec purge, 15 second PTFI, 10 second post purge, no FM Approval. Programmer, Immediate ignition and pilot after limits are closed, 10 sec PTFI (fixed), 10 sec MTFI, intermittent pilot, non-recycle on flame fail. Programmer, Relight operation, 10 sec PTFI, 15 sec post purge. Programmer, 30 sec purge, 5 sec PTFI, 15 sec post purge, Prove air at start, 8 sec pilot stabilization, non-recycle on flame fail. Programmer, 30 sec purge, 5 sec PTFI, 90 sec post purge, prove air at start, 8 sec pilot stabilization, non-recycle on flame fail. Programmer, Selectable recycle/non-recycle function, TFI timing, purge timing, post purge, prove open at start. Programmer, Selectable recycle/non-recycle function, TFI timing, purge timing, post purge, prove open at start, 8 sec pilot stabilization. Programmer, Selectable recycle/non-recycle function, TFI timing, purge timing, post purge, prove open at start, lockout on air flow open 10 seconds after the start of a cycle, selectable recycle/non-recycle lockout on air flow open after flame is proven, and dedicated lockout after loss of flame. Programmer, Selectable recycle/non-recycle function, TFI timing, purge timing, post purge, prove open at start. Ignition de-energized 3 seconds after pilot detected. Provides 8 second pilot stabilization period. Programmer, Selectable recycle/non-recycle function, TFI timing, purge timing, prove open at start, and post purge (0 to 90 seconds). Same as MEP560 without pilot stabilization period. Will not lockout on air flow open during purge. Programmer, Selectable recycle/non-recycle function, TFI timing, purge timing, post purge, prove open at start, 8 sec pilot stabilization, 10 sec main trial for ignition, run-check switch. Programmer, Selectable recycle/non-recycle function, TFI timing, purge timing, post purge (30 sec max), prove open at start, 10 sec main trial for ignition, run-check switch. Programmer, Selectable TFI timing, purge timing, post purge, prove open at start, 8 sec pilot stabilization, 10 sec main trial for ignition, with lockout on loss of air flow. Non-recycle, run-check switch. Same as MEP560 except purge timings are 7 30, 60, and 240 (4 minutes) seconds. Programmer, relight operation on main flame fail, lockout on PTFI and MTFI flame fail, 10 sec PTFI (fixed), 5 sec pilot proving, 5 sec MTFI. Programmer, 5 sec purge, 10 sec PTFI (fixed), 5 sec pilot proving, 10 sec MTFI, interrupted pilot, interrupted ignition, non-recycle on flame fail. Programmer, 15 sec purge, provides interrupted ignition, interrupted pilot, non re-cycle on flame fail. Programmer, Valve proof of closure, selectable purge, PTFI timing, intermittent or interrupted, recycle / non-recycle operation, reset by power interruption of manual reset. Programmer, provides selectable PTFI, selectable baud rate, and selectable recycle / non-recycle operation. For use with MEC320TS chassis only. Programmer Selectable TFI timing, purge timing, post purge, prove open at start, and recycle / non-recycle on flame fail. Includes 5 sec pilot proving, early spark termination, 5 sec MTFI, and interrupted pilot. UV amp, 0.8 sec FFRT. Use with UV1, UV2, 45UV3. UV amp, 3 sec FFRT. Use with UV1, UV2, 45UV3. UV self check amp, 0.8 sec FFRT. Use with 45UV5-1008, -1009. UV self check amp, 3 sec FFRT. Use with 45UV5-1008, -1009. Flame rect amp. 0.8 sec FFRT. Use with 69ND, 45CM. Flame rect amp. 3 sec FFRT. Use with 69ND, 45CM. Infrared amp, 0.8 sec FFRT. Use with 48PT2 scanner. Infrared amp, 3 sec FFRT. Use with 48PT2 scanner. Cadmium sulfide amp, 0.8 sec FFRT. Use with C554A scanner. Cadmium sulfide amp, 3 sec FFRT. Use with C554A scanner. Programmer, Selectable recycle/non-recycle function, TFI timing, purge timing, post purge, prove open at start. Provides 0.30 second flame failure response time, for use with Phoenix and InSight flame scanner and MEDC2 amplifier. Amplifier for use with dry contact input from 85UVF-WR flame scanner, 0.30 sec FFRT. Use with MEP237 and 85UVF4-1QDWR, 85IRF4-1QDWR, or InSight scanner (with 59-497-020WR cable). Standard daughter board, local reset switch. Daughter board with local reset switch, display output. Daughter board with local reset switch, remote reset. Daughter board with local reset switch, display output and remote reset. Daughter board with local reset switch, display output and communications. Daughter board with local reset switch, display output, remote reset, and communications. Daughter board with local reset switch, communications. Closed wiring base for surface mtg., use with M-Series II and MicroM. Open wiring base for cabinet mtg., use with M-Series II and MicroM. Wireless monitoring system. Monitors up to 10 Flame-Monitor and/or MicroM controls, 4 dry contact inputs, and 4 AC inputs Complete with 3 inch, 1/4 wave antenna. Serviceman's display kit. Consists of ED510 with back plate, MED2, and ED580-4. Replaceable fuse for MicroM MEC120 chassis. Wickman fuse #19378-071-K, 10 amp. Replaceable fuse for MicroM MEC230 chassis. Wickman fuse #19373-062-K, 4 amp, 250 V.
UV / FR flame simulator used in 57AV7 tester. Tester, 120 VAC, for use with M-Series, M-Series II, MicroM.